We decided to visit a market in Brooklyn on our last day in New York, going there by Subway on one of the routes that goes under the river and then emerges above ground. We found the building but the market had moved to another part of Brooklyn. It took some time to get to the new location only to discover that the market wasn’t open on that day. 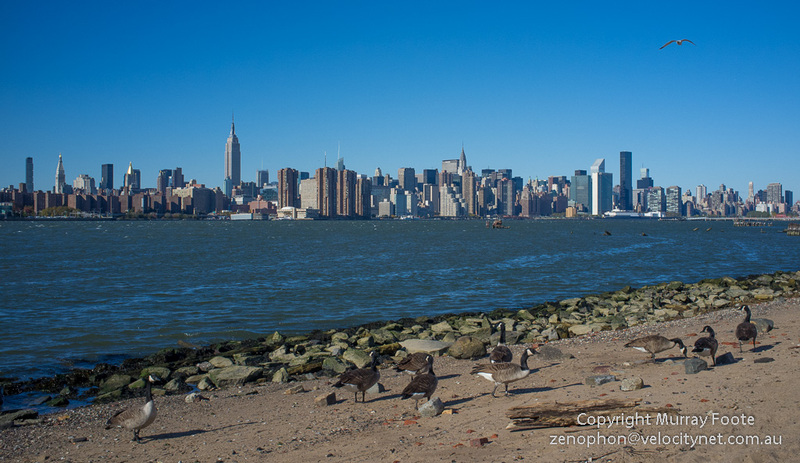 So we wandered to a nearby park at the waterfront with a view across to Manhattan and a flock of Canada geese at the shoreline. We had great difficulty finding a taxi that day. Most weren’t available and the few that were weren’t interested. So we did a lot of walking in between subway stations. I was intrigued by all the Hebrew lettering in this view at one point in our somewhat random wanderings. 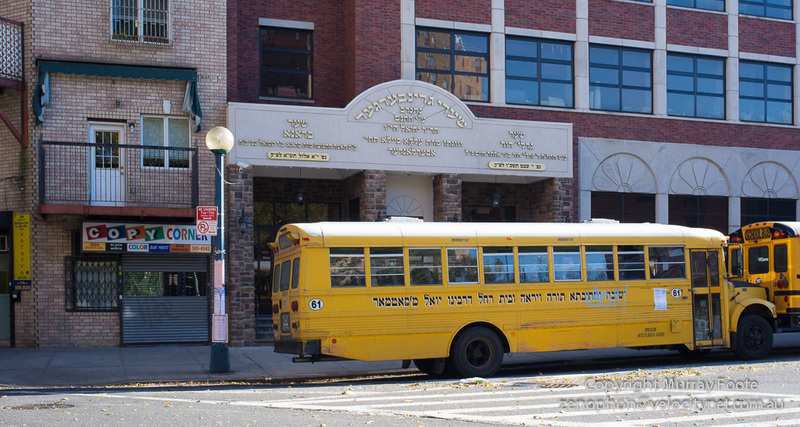 I presume it is a Jewish school and school buses. When we finally reached a subway station, we travelled to Brooklyn Heights where we found a pub/ restaurant for a very nice lunch. This is not something to be taken for granted in New York. It is not the sort of place where everything is a wonderful culinary adventure. There is plenty of good food, though it is usually expensive and first you have to find it. In the part of Manhattan where we were staying the cheap food was generally appalling, even the pizzas which I would have thought to be reliable. After the meal, we came out on the promenade along the shore of the Brooklyn Heights for the view across to Manhattan that you see above. It is just as well we were in Manhattan from late October to early November in 2011 rather than in 2012 because Hurricane Sandy swept through on 28 October 2012 with a 14-foot peak storm surge. Had we been there then and stayed in our hotel during the storm, we would have emerged to find the Subway flooded, taxis unavailable because their parking lot went under, no electricity and most places closed. Mind you, it was much worse in the Caribbean, especially Haiti where over 100 people died. The vista above might also have been the view of George Washington in late August 1776, except with no development on the Brooklyn shore and relatively few low buildings at the end of Manhattan Island only. He had brought his army here and waited for the British to attack but they were rather more successful at this than he had anticipated and he ended up surrounded by land and sea. However, he manage to sneak the army across the river to Manhattan in the dead of night, through a British naval cordon, thereby avoiding the imminent threat of annihilation or capture. In 1626 you would have been looking across at the nascent Dutch colony of New Amsterdam (if it were even visible at this distance). In 1609 you might have seen the sails of Henry Hudson and in 1524, those of Giovanni da Verrazzano (a Tuscan exploring for France). A thousand years ago you might even have seen a Viking longboat or two here. No one really knows where Vinland was, the place where the Vikings had a few brief settlements. Many favour Newfoundland for this, specifically the settlement at L’Anse aux Meadows. This partly corresponds to an interpretation of Vinland as Land of Meadows rather than Land of Vines. However, a mediæval Danish King referred to Vinland specifically as a land of wine grapes. If so, Newfoundland was too cold to be Vinland while early visitors to New York remarked on the wild grapes growing in the region. An Icelandic Saga I read refers to “Algonquins” possessing a “ballista”, a wooden catapult weapon used in Europe in ancient and mediæval times. This sits better with New York Indians, who would have been more organised than the tribes in Newfoundland. It also raises another unanswerable question of whether this was parallel development or reflects some prior Greek, Phoenician or Roman contact. Although it is unprovable, the Vikings could well have settled on Long Island (Brooklyn) or Manhattan Island.